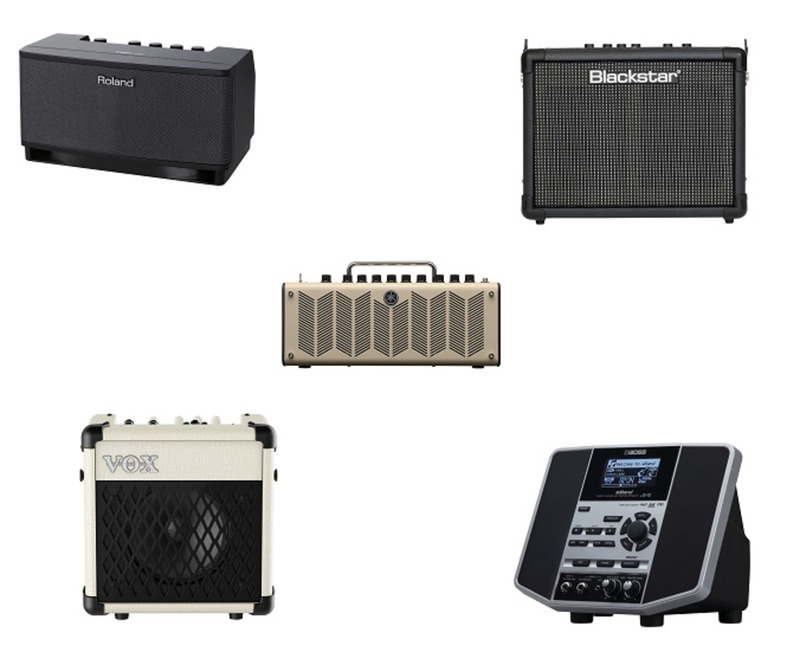 Why do I need to get out of the pentatonic box? My experience as a guitar teacher has shown me that improvising with the pentatonic scale is easy with a little guidance. There are few horrible sounding notes and understanding which are the most important notes to return to and which notes are the best notes to bend is something you can quickly pick up. 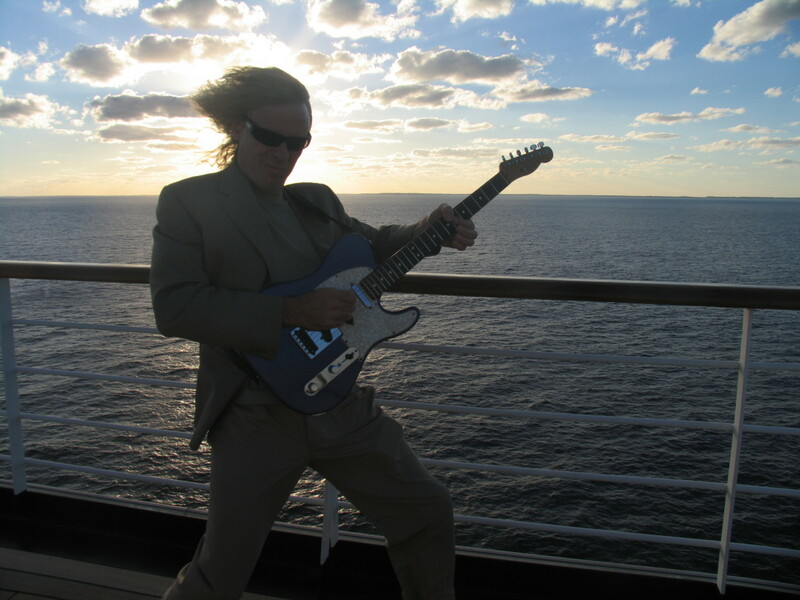 Once the pentatonic box is known and mastered a competent guitarist can improvise in virtually any key whether major or minor. However there comes a time when solos start to sound the same and when you can predict how you are going to sound you start to want a little more spice and variety in your playing. The first step to playing more interesting solos lies in extending the pentatonic and getting out of the pentatonic box. 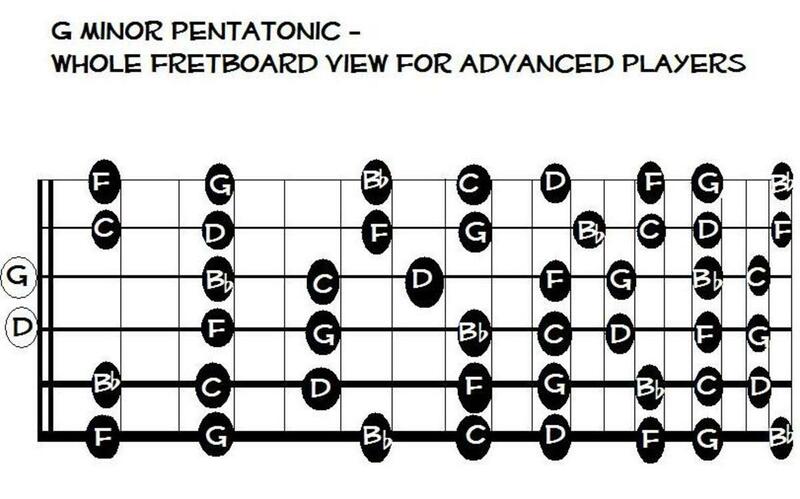 Most guitar tutors (whether real, on line or in print) will introduce you to the pentatonic box first and then teach you another four shapes, or inversions, of that scale on the fretboard. Your job is to learn each, practise soloing with each and eventually integrate them into one complete fretboard map. This is a sound approach but its eventual and inevitable outcome is that you need to join ALL of the dots yourself. As a teacher I tend not to do that as once a student feels bored in the box and I judge that he or she is competent to move on I find it nearly always works best to use a whole fretboard approach. Learning and understanding the whole fretboard really opens up your creativity as a soloist. I use the concept of "anchor notes" to help preserve a sense of key. In any key, the anchor notes are the root and fifth of the scale or tonic and dominant. The fourth is less vital as it is absent from the minor pentatonic anyway. These notes are the basis of the primary chords and give a sense of "home" to the listener. The best note to bend in the minor pentatonic is probably the seventh (although you can in fact bend any note of the scale to the next note). In A minor pentatonic, those anchor notes are A and E. You can memorize my diagram without learning the names of course, but knowing that A and E are the anchor notes, knowing which notes they are, and returning to them continually will keep the listeners happy. When you improvise it is beneficial to keep the listener feeling secure for a while, then add fireworks or bizarre moves, then return to home. How to extend the pentatonic scale in improvising. 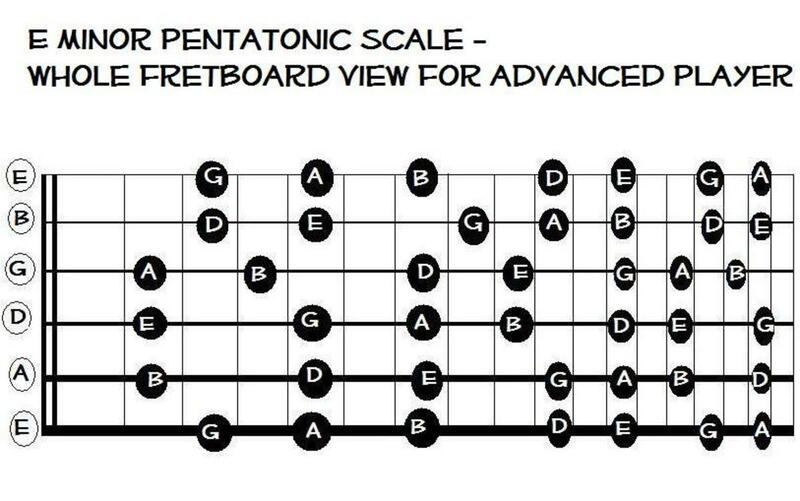 You need to be completely familiar with the pentatonic box first. Once you feel confident then slide into the 1st finger notes from two (or three) frets behind which is the previous shape. 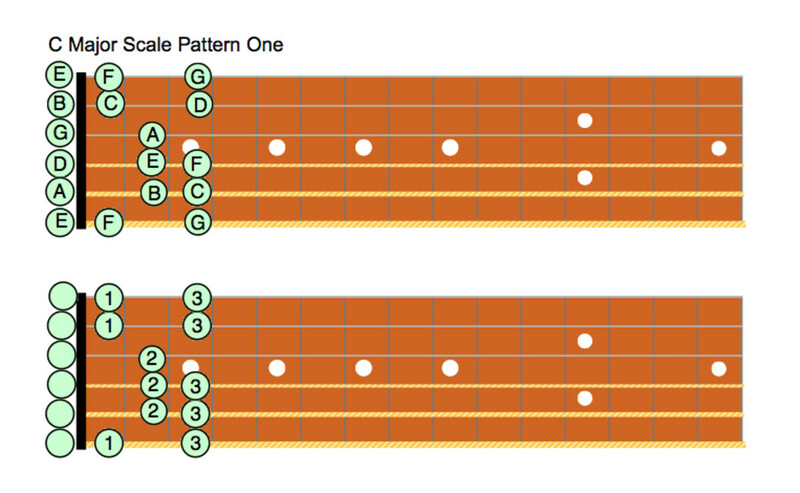 As a next step, slide your 3rd and 4th finger notes two (or three) frets into the next section of the map. Try the same slides, but allow the 1st finger to take the place of the 3rd and 4th finger notes after the slide. This takes you into the next stage of the map. Start with the open position shape, solo for fifteen seconds or so, then slide into the box position, solo, slide into the next position etc until you have used the whole fretboard. The shape for Key C is identical, but the anchor notes are different. The emphasis needs to be on C (tonic) and G (dominant). Major scale improvisation is often more difficult but that is because people do not realise they are still dealing with (mostly) pentatonic notes. What causes the clash in the major scale are the fourth and seventh notes which move by semitones and have more tension. Using A minor pentatonic but emphasizing C and G prevents this difficulty and if you do this with the A minor blues scale you get an amazing country blues sound that is truly professional and uplifting to hear. 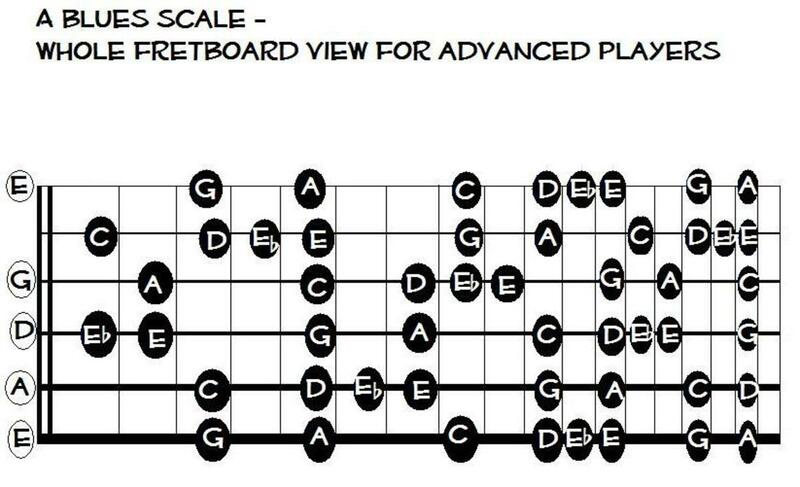 This map will work with songs using Am, D (or Dm) and E (or Em or E7) as the main chords. 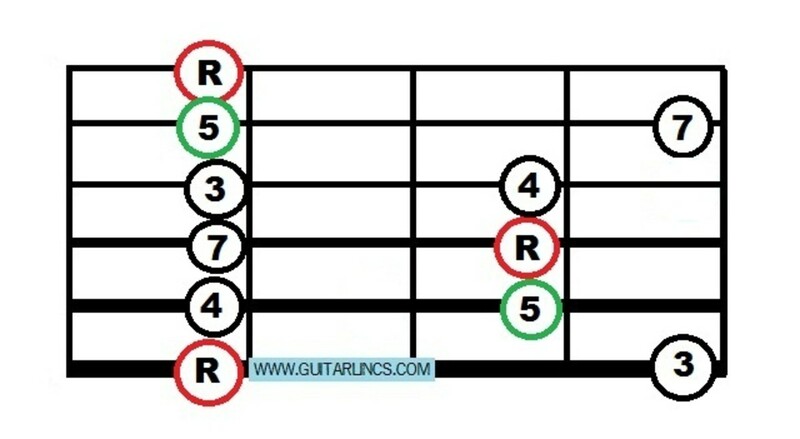 Other chords might be Bm, F, G but these will not be used frequently as they are secondary chords. Your "anchor notes" should be A and E.
Using the same maps with the primary chords of C, F and G (or G7) plus secondary chords of Dm (D), Em, and Am works well for C major key songs. Your "anchor notes" should be C and G.
But what about other keys? Not a problem, the relationships between the notes stay exactly the same but your scales will start in a different place and use different "anchor notes". The most common keys for rock are A minor and E minor so our next map is for E minor pentatonic (or G major pentatonic) The anchor notes are going to be E and B in the key of E minor and G and D in the key of G major. Same scale shape, different emphasis. 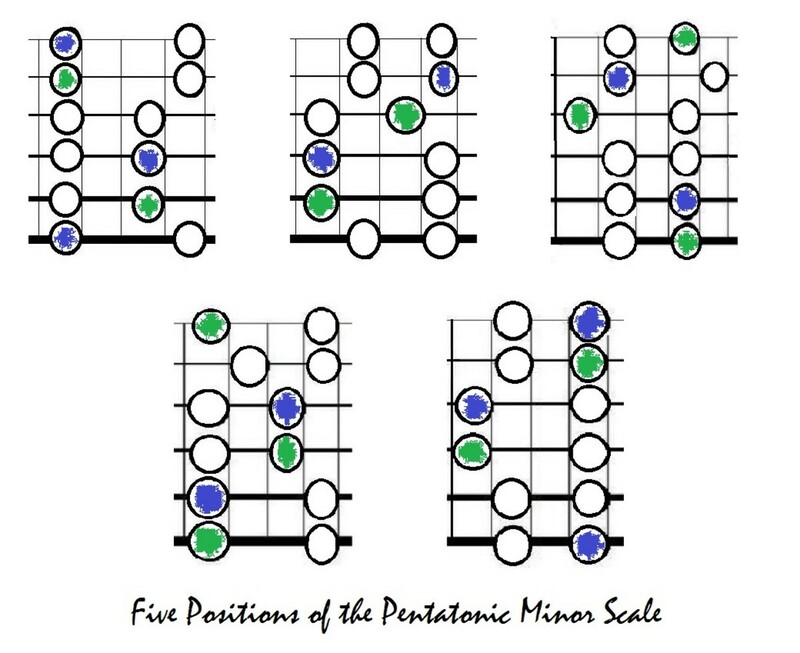 Once you have mastered A minor pentatonic you might try E minor pentatonic and then move on to G minor pentatonic. A song in the key of E minor will use mostly Em, Am and Bm (or B7). Your anchor notes will be E and B. Use them frequently. In the key of G, your most frequent chords will be G, C and D (or D7) and your anchor notes will be G and D.
If you work with both these patterns until completely familiar with the "moves" you will be ready for the next stage. This next stage is to move and shift the entire shape over the entire fretboard in all possible keys. If you can do this, you will become a competent soloist in blues and rock and might even hold your own in traditional jazz! The Fretlight guitar enables you to learn whole scale improvising without the theory. Its on board computer controls a system of LED lights that can show chords, scales and arpeggios you programme in, including a whole fretboard realisation of the pentatonic scale in any key. Smoke on the Water anyone? G minor is the key for Smoke on the Water and you can have fun with this shape by soloing over the whole song. Your anchor notes are G and D, your best bend is F. You can also use this map for soloing in the key of Bb major, anchor notes are Bb and F for this. I hope by now that you are starting to "feel" the fretboard map. Feeling the fretboard and hearing notes before you play them makes the difference between intermediate players and advanced players. There is still much more to learn of course but as you learn more and more it gets better and better. 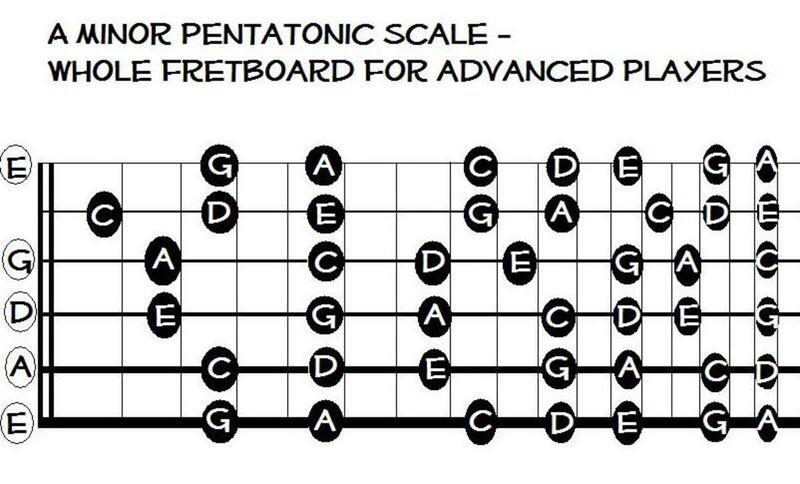 Good luck with extending your pentatonic! Do you find improvising easy? Do you find improvising easy or difficult? 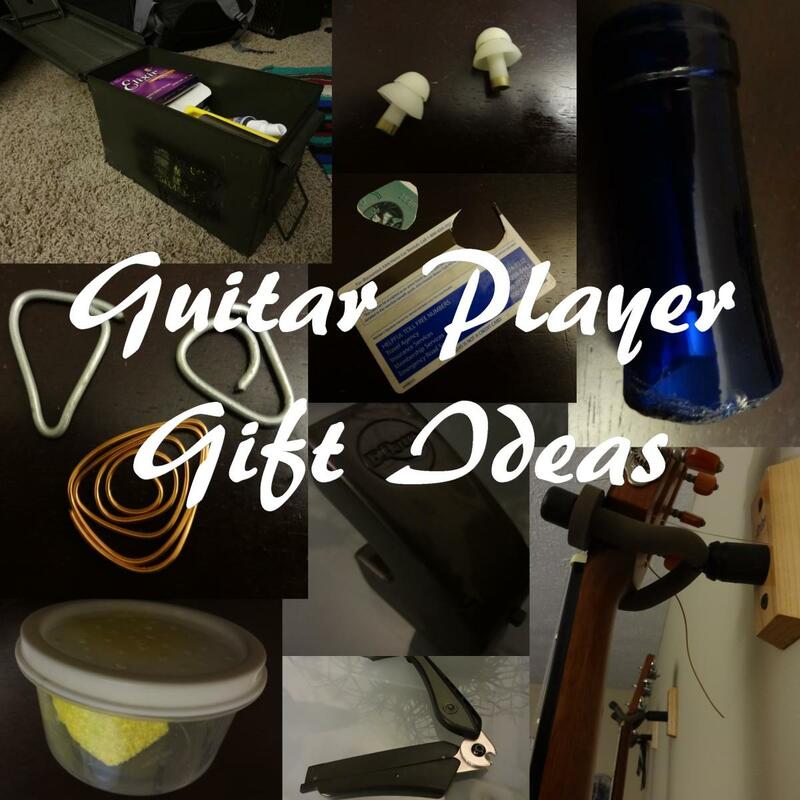 I feel happy with the pentatonic box and the blues scale. I still need to master the basics but am willing to give it a try. I thought it was hard but visual shapes do help. I have never tried it before but I might do now. Wow,this video makes a lot of sense,i love how u give a clean example of what you can aclmcpoish with the scales. Other videos just give the scale n state u can make lovely leads using that scale,yet leave us in the dark on what that would sound like.Like telling someone the ABC's can be sung rhythmically,yet not singin it for them,leavn them in the dark,not knowing the true potential.Ive never really practiced scales,after this video,Im going to master as many as possible,thank u for the spark!